Send E-Mail to Urbie. Click Here. New Urbie Tribute Page - Click Here! 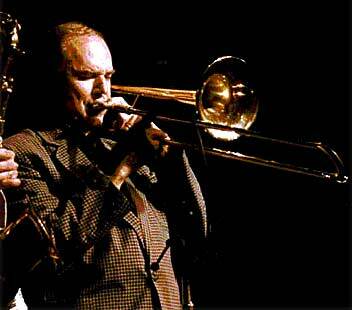 Martin trombonist Urban (Urbie) Green, known as the “trombonist’s trombonist,” is one of the true greats of jazz, among the elite of the world’s trombone players. Urbie Green has toured with Woody Herman, Gene Krupa and Frankie Carle and has been cited numerous times in Down Beat magazine’s annual critics awards. Green has also established an extensive career as a free-lance trombonist for recording artists such as Count Basie, Frank Sinatra, Leonard Bernstein, Louis Armstrong and others. He has approximately 30 albums under his own name, appeared in the film version of The Benny Goodman Story and appears at major jazz festivals. Lately his solo career has taken him around the world three times in as many years. Urbie’s collaboration with Martin design engineers has led to innovations in the comfort of the hand brace and slide, an improved water hole with a curved key that empties easily in one turn rather than several shakes, and a goose neck that is chrome-plated to prevent players’ clothing from becoming marked by brass. 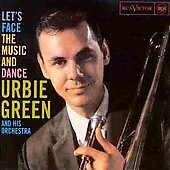 To that select list of wonderful instrumentalists who have led their own dance bands to fortune and everlasting fame, you can add the name of URBIE GREEN. No one…but no one… plays smoother, warmer, more mellow trombone. Urbie Green was born and raised in Mobile, Alabama, and by the time he was sixteen was working professionally with Tommy Reynolds’ band. There followed music and years with Jan Savitt, Frankie Carle, Gene Krupa, and finally, Woody Herman. In October 1950, Urbie became part of Woody Herman’s Thundering Herd, and in 1954 won the Down Beat International Critics Award for NEW STAR. Urbie became one of the most sought-after trombonists for recording and club work in New York City. He is a multiple winner of the Most Valuable Player Award from the National Academy of Recording Arts and Sciences, and perhaps the most recorded musician of all time. He has recorded with Gene Krupa, Woody Herman, Benny Goodman, Louis Armstrong, Count Basie, Leonard Bernstein, Frank Sinatra, Billie Holiday, Tony Bennett, Peggy Lee, Pearl Bailey, Ella Fitzgerald, Mile Davis, Charlie Parker, Coleman Hawkins, Dizzy Gillespie, Barbara Steisand, Perry Como, Aretha Franklin, Quincy Jones, J.J.Johnson, Antonio Carlos Jobim, Burt Bacharach, Buck Clayton and Herbie Mann, to name a few. He was seen and heard in the movie “The Benny Goodman Story”, and shortly afterwards fronted the Benny Goodman Orchestra for a three month tour. He has appeared in major jazz festivals, motion pictures, concert halls, nightclubs, radio, television and the White House. In addition, Urbie has performed at Lincoln Center with an all-star band led by Benny Carter in a special tribute to Ella Fitzgerald, and in Thailand, with the Benny Carter all-stars in a special performance for the King of Thailand. Urbie Green Septet 10-inch album (Blue Note 1954)***, Urbie Green And His Band 10-inch album (Vanguard 1954)***, A Cool Yuletide 10-inch album (X 1954)***, East Coast Jazz/6 (Bethlehem 1955)****, Blues And Other Shades Of Green (ABC-Paramount 1956)****, Best Of The New Broadway Show Hits (RCA Victor 1957)***, All About Urbie Green (ABC-Paramount 1956)***, Let's Face The Music And Dance (RCA Victor 1958)***, The Persuasive Trombone Of Urbie Green (Command 1960)***, The Persuasive Trombone Of Urbie Green Volume 2 (Command 1962)**, And His 6-Tet (Command 1963)**, 21 Trombones (Project 3 1968)****, 21 Trombones Volume 2 (Project 3 1968)***, Green Power (Project 3 1970)***, Bein' Green (Project 3 1972)***, The Fox (CTI 1976)**, Senor Blues (CTI 1977)****, Live At Rick's Café Americain (1978)**, The Message (Fresh Sound 1988)***, Sea Jam Blues 1995 recording (Chiaroscuro 1998)***. MORE DISCOGRAPHY INFO - JUST LOOK AT SOME OF THESE GREAT GROUPS OF MUSICIANS! urbie green (tb), john grimm (fl), walter wanderley (org), bucky pizzarelli (guitar) + orch. My blue heaven, stompin' at the Savoy, Johnson rag, C jam blues, one o'clock jump, rose room, in a mellow tone, rio Rita, i've got a feelin', i saw stars, breakin' in a pair of shoes, should i?, at last, i married a angel, say it, you're a sweetheart, ..